LumaSense Technologies specialises in reducing inefficiency and preventable waste in the most resource-intensive industries. Founded in 2005, the company’s solutions detect, reduce and prevent inefficiency and waste in the global energy, industrial materials and advanced technologies markets. LumaSense’s solutions are used by customers to achieve sustainable, predictable and verifiable improvements in process efficiency and waste reduction. LumaSense provides temperature and gas sensing equipment to optimise the performance of boilers, furnaces, refineries, substations and transformers. LumaSense has more than 30 years of experience in the fibre optics market, and its LUXTRON solution measures fibre optic temperature in transformers. The company’s LumaSMART winding hot-spot temperature system is an advanced and reliable real-time monitoring solution. LumaSense is a leading company in fluoroptic (FOT) technology, with decades of proven expertise. The LumaSMART FOT hot-spot monitoring systems provide accurate, real-time temperature readings for the protection and control of critical power transformer assets. The LumaSHIELD is a reliable, fully scalable multi-channel signal conditioner built for smooth and easy field deployment. It has an innovative and simple design, and improved integration flexibility. It provides reliable real-time temperature measurements and direct on-screen and on-PC display of real-time winding temperature. It can collect and store temperature data via its internal data logging system. Customers can continuously monitor and control the condition of transformers to detect critical situations with the LumaSense online monitoring solution, which is based on proven, state-of-the-art non-dispersive infrared (NDIR) technology. LumaSense’s leak detection system 3434i measures the concentration of SF6 gas, which is most potent greenhouse gases, in an enclosed area of a GIS substation to determine the leak rate. The LumaSpection™ TS724DV remote thermal monitoring system uses a multiple camera system to allow remote monitoring of temperatures in real time via image data, which is gathered from one or more cameras and then sent to a single central controller. The system, which has advanced maintenance-free electronics and industrial protective packaging, provides accurate readings for industrial and electric utility settings. It can also be used in adverse environments. 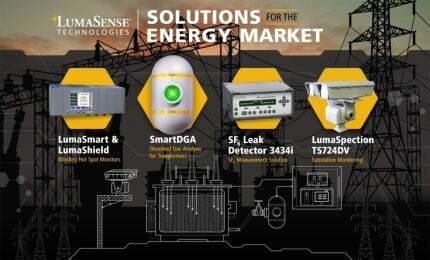 LumaSense Technologies provides professional solutions for the global energy market.We offer dedicated solutions for utilities to control and monitor aging assets.